On January 27, 1925, the Reverend Bernard Coffindaffer was born at Craigsville in Nicholas County. At age 59, he was taking a nap one day and had a profound religious experience. During World War II, he served in the Marines and was wounded on Iwo Jima. After the war, he returned to West Virginia and amassed a small fortune through a coal-washing business. At age 59, he was taking a nap one day and had a profound religious experience. 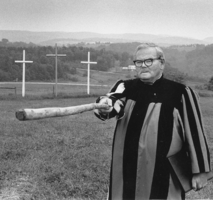 He later recalled that the spirit of God had told him to build crosses across the countryside—beginning in West Virginia and then extending to all 50 states. He promptly sold his business interests and founded Cast Thy Bread, a nonprofit organization that erected prefabricated crosses. He built the crosses in groups of three to symbolize the crucifixion of Jesus. A yellow cross was erected in the middle, surrounded by two blue ones. At one point, nearly 1,900 clusters of these crosses could be found in West Virginia and in other states and countries. He poured millions of his own money into the effort until he was broke. Coffindaffer died of a heart attack in 1993 at the age of 68. At one point, nearly 1,900 clusters of these crosses could be found in West Virginia and in other states and countries.